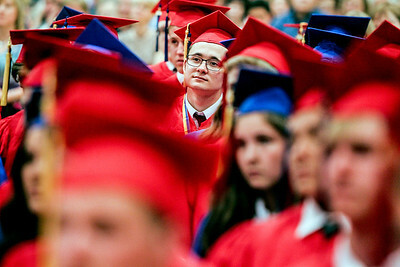 Sarah Nader- snader@shawmedia.com Marian Central graduates listen to Bishop David Malloy speak during Friday's commencement ceremony at Marian Central Catholic High School in Woodstock May 30, 2014. 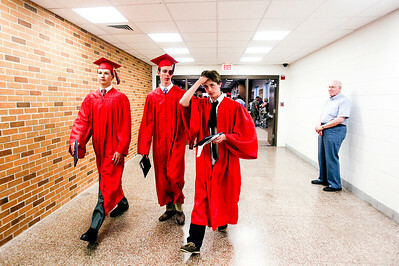 Sarah Nader- snader@shawmedia.com Marian Central graduates drop off their cap and gowns after Friday's commencement ceremony at Marian Central Catholic High School in Woodstock May 30, 2014. 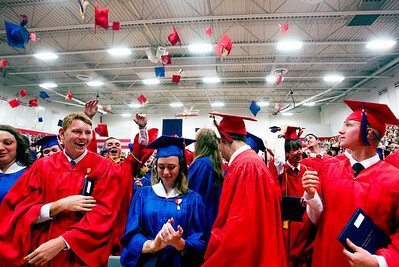 Sarah Nader- snader@shawmedia.com Marian Central graduates throw their caps in the air at the end of Friday's commencement ceremony at Marian Central Catholic High School in Woodstock May 30, 2014. 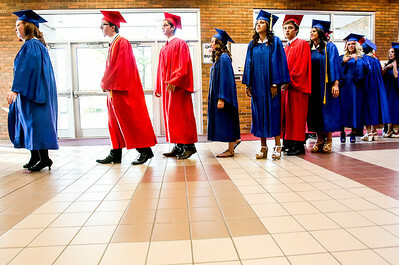 Sarah Nader- snader@shawmedia.com Marian Central graduates line up before Friday's commencement ceremony at Marian Central Catholic High School in Woodstock May 30, 2014. 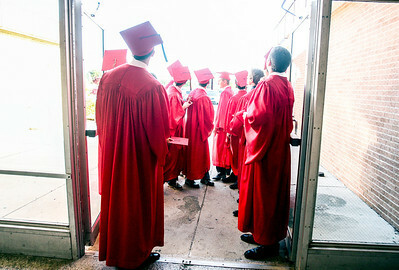 Sarah Nader- snader@shawmedia.com Marian Central graduates get some fresh air before Friday's commencement ceremony at Marian Central Catholic High School in Woodstock May 30, 2014. Sarah Nader- snader@shawmedia.com Marian Central graduate Jacqueline Guilbeault, 17, of Algonquin (left) walks to the gym with her classmates during Friday's commencement ceremony at Marian Central Catholic High School in Woodstock May 30, 2014. Guilbeault plans to study at Viterbo University and major in secondary english education. 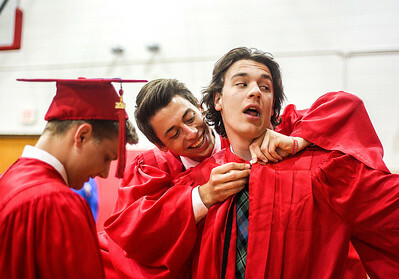 Sarah Nader- snader@shawmedia.com Marian Central graduates, Bailey Mc Crea (left), 18 of Lakemoor and Maxwell Spoden, 17, of Crystal Lake help Anthony Partaker put on his gown before Friday's commencement ceremony at Marian Central Catholic High School in Woodstock May 30, 2014. Sarah Nader- snader@shawmedia.com Marian Central graduate Caroline Hellman (center), 17, of Island Lake talks with friends before Friday's commencement ceremony at Marian Central Catholic High School in Woodstock May 30, 2014. Hellman plans to study and Miami University of Ohio this fall. 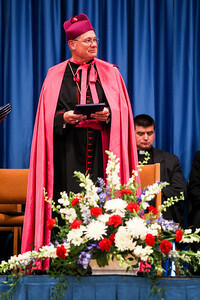 Sarah Nader- snader@shawmedia.com Bishop David Malloy hands out diplomas during Friday's commencement ceremony at Marian Central Catholic High School in Woodstock May 30, 2014. 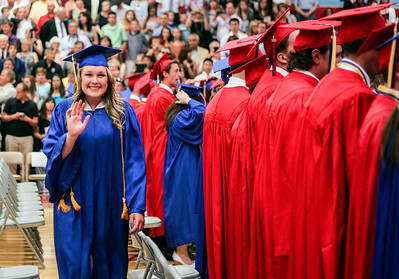 Sarah Nader- snader@shawmedia.com Marian Central graduate Jamie Prus waves at family during Friday's commencement ceremony at Marian Central Catholic High School in Woodstock May 30, 2014. Marian Central graduate Caroline Hellman (center), 17, of Island Lake talks with friends before Friday's commencement ceremony at Marian Central Catholic High School in Woodstock May 30, 2014. Hellman plans to study and Miami University of Ohio this fall.